If you're feeling in the mood for watching a movie based on a novella which inspired a comic book, hey my friend, today's your lucky day. A lucky day for you to also check out the following 74 minute movie made in 1974. It was Directed by: Jerry London; and Starred: Clint Walker, James Wainwright, Carl Betz, with Neville Brand. It wants to kill us, men. Why it wants to kill us? I have no idea. Who's controlling it? Same answer. But I'll tell you something for nothing. When I first took on this demolition job we're currently involved with, I never would have thought I'd be running away from one of our very own rampaging bulldozers! Well, as I'm sure you're already too aware of, so far the 'D9' has killed two of our work colleagues. First it fried Mack (Robert Urich) in what seemed like a freakish accident. And then some time later, when Al (James Watson) decided to take it out for a joy ride, well, let's just say he didn't get much joy out of it, although the bulldozer did. Still. Where does that leave the rest of us, eh? All of our equipment has been smashed to smithereens. We're stuck out in the middle of nowhere. And the only thing we've got going for us is our fairly chiselled good looks. Then again, that's most probably why what next transpires all goes 'beep-beep' when Dennis (Carl Betz) looks over at me and says, 'Lloyd! (Clint Walker) When are you going to get it through your think skull you can't kill a machine!'. As Chub (Neville Brand) gets squashed in his car - Dutch (James Wainwright) doesn't get very far - a bulldozer finally stands it ground - and at the end of the day, a piece of machinery is carted off to the nearest impound. In my opinion 'Killdozer!' is one of those films which should have been made into a comedy rather than a thriller. Well. Let's face it, folk. Conceptually it's about a bulldozer that gets possessed by a meteor from outer space, and -- as you do -- decides to takes it upon itself to kill a bunch of workmen who actually need this piece of equipment to get their job done. Plus to make matters even worse, the whole thing was set in a barren yet desolate quarry, and was complemented with a bunch of actors who deserved a much better script to play off of. OK. I have to admit. I am a bit biased because I'm big Clint Walker fan. And by in large I'm used to seeing him in films that have a much more associative tone to them. But where on Earth is the associative tone tagged onto this piece, eh? Who in there right minds can associate with a group of workmen running away from a bulldozer possessed by an evil entity from beyond the stars? I couldn't! And I'm pretty damn certain you couldn't too. 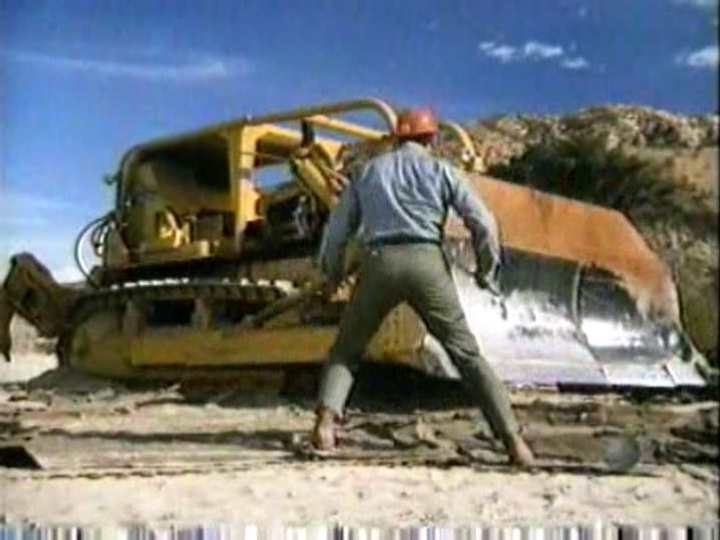 However, having said all that, the one thing I did enjoy about this movie were those scenes where the dreaded bulldozer in question flashed its scary headlights, and -- as I said previously -- went around squashing and bashing whoever came its way. In fact, I liked these rather suspenseful sequences to such an extent, I thought it was a bloody shame that whoever wrote it couldn't have put as much effort into giving it some sort of motivation. Heck, to be perfectly honest with you, dear reader, I can say exactly the same thing about some of the characters as well. Admittedly. Even though from a performance point of view most of the actors did a pretty good job with what they had at hand, as push comes to shove I'm sure the whole thing could have been a lot better if each of them possessed an archetypal trait. You know. One of them could have been made into a fast talking comedian. Another a more flamboyant chap. And yet another a butch yet surly type. But no. Whoever was behind this flick made them all into generic workmen with a communal history which never really aided the plot. Anyway. Before I ramble on too much about this flick let's shift gear for a moment and check out the following filmic facts. (1) The 'NBC' television network first broadcast this TV movie on the exact same day Barbra Streisand reached the top of the charts with her hit song, "The Way We Were". It was on the 2nd of February, 1974. (2) When this project was released in Japan it was given the name, 'Satsujin burudôzâ'. (3) The majority of this movie was shot on location at Indian Dunes, Ventura County, located within the American state of California. (4) One of the taglines used to promote this picture, was, 'Everyone Knows a Machine Cannot Kill. Except the Machine'. 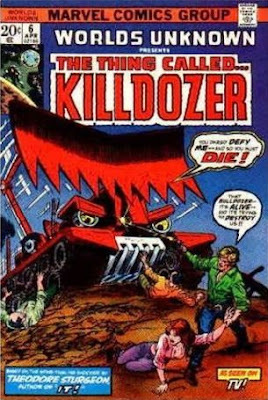 (5) Nine years after this thriller was released a rock band from Wisconsin decided to christen themselves with its title -- Killdozer. (6) This adventure was loosely based on a 1944 science fiction novella written by Theodore Sturgeon, who first published it in the pulp magazine, 'Astounding'. (7) Thankfully this film was given cult status because it kept on getting referenced in such television shows as 'Beavis and Butthead', and 'The Tonight Show with Conan O'Brien'. (8) In the same year this movie was released, Marvel Comics published their adaptation created by Gerry Conway and Richard Ayers, and it was seen in the comic book, 'Worlds Unknown' #6. 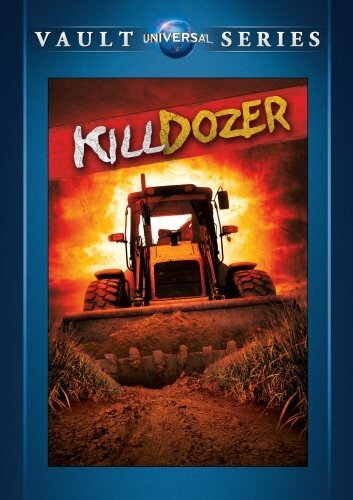 Overall I'd say 'Killdozer' was a film that could have been a lot better than it was, yet still ended up becoming a cult classic by mistake. So if you're one of those people who like seventies bent adventures about workmen and rampaging machines, here, this one is for you.